One of the longest serving players on the staff. Iain has been around a long time and played in almost every position in every team. At present first team captain and youth team organiser. Recently took the Level 1 coaching course to enable the youth team to become the supply of new talent the club needs. Once the proud wearer of a kangaroo syrup, realised he looks better as nature intended, and has now opted for a no option cut instead. Works tirelessly to produce top class wickets at Chew Court, though before the introduction of helmets the strip often suffered from localised showers, especially when we were up against someone a bit sharp. Former DJ and Fag salesman, Iain is now into computers and all the peripherals that go with them. 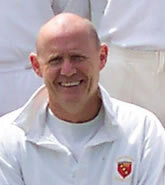 Known throughout the county on the cricket circuit and is a good ambassador for the club where ever we go.